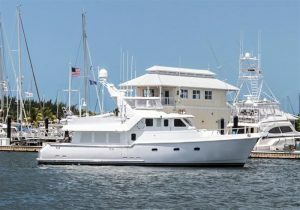 This used 57' Nordhavn for sale is now located in the Florida Keys! : Atlantic Yacht & Ship, Inc. This beautiful used 57′ Nordhavn yacht for sale is now located in the Florida Keys! Don’t miss this beautiful used 57′ Nordhavn yacht that Gregg Silver has listed for sale! In the first place, this sea-worthy used 57′ Nordhavn yacht is known as “Snow White”. After all this is the lowest priced 57′ Nordhavn currently on the market! In a word she features an accommodating three stateroom layout. This is a vessel capable of comfort and safety when cruising. Additionally this particular yacht is full loaded with upgrades and features! You will love everything this used 57′ Nordhavn yacht has to offer. Similarly to the comfortable layout this yacht is practical. With a wing station for easy handling, stabilizers, bow AND stern thrusters she checks all the boxes. In fact, this particular model is one of the most tank-tested designs to bear the Nordhavn name. The bulbous bow and custom streaks make it one of the fastest displacement hulls for its size. The Portuguese forward deck and high bulwark only add to making this safe and stable. For more information on this beautiful used 57′ Nordhavn yacht for sale be sure to contact Gregg Silver today! Check out this 57′ Nordhavn yacht for sale! Just listed! Check out this beautiful used 57′ Nordhavn yacht for sale! Check out this beautiful used 57′ Nordhavn yacht for sale! Check out this used 46′ Meridian yacht for sale in the Florida Keys!